First Day Back…First Big Crash. Yesterday afternoon, during my (Chloe’s) first ride back outside after a long winter, I crashed, for the first time in my triathlon/biking career! Now this wasn’t just an “I cant get my foot out of the clips fall over” kind of fall. I hit the ground hard. I’ve got road rash on my hand and arm, a bruise on my leg/rear the size of my head, a cracked helmet and a war wounded bike. All’s well that ends well (with the help of some ice and Advil), but it was definitely not such a sweet first day back riding outside…. 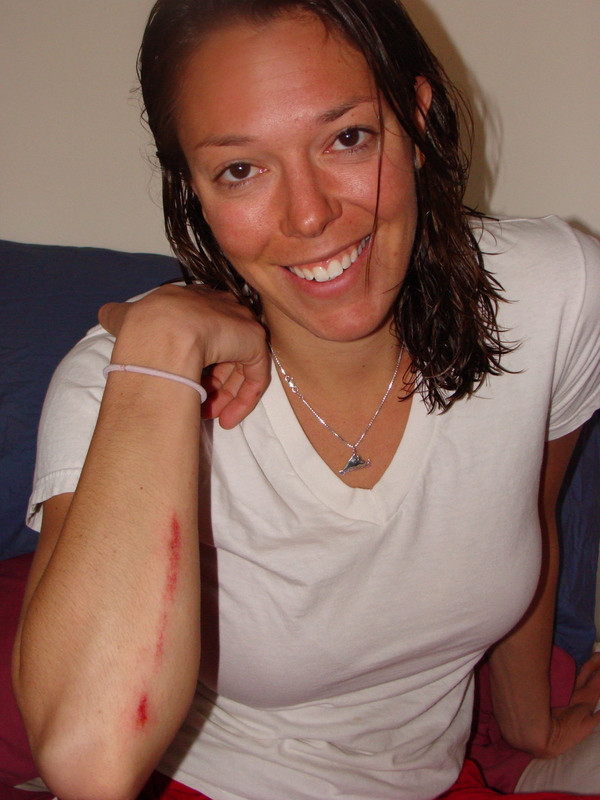 I’ll give you some more of the gory (actually it wasn’t really so gory) details a little later, but let me back up for a second and begin my post the way I had planned to pre-bike crash. My day was off to a great start! 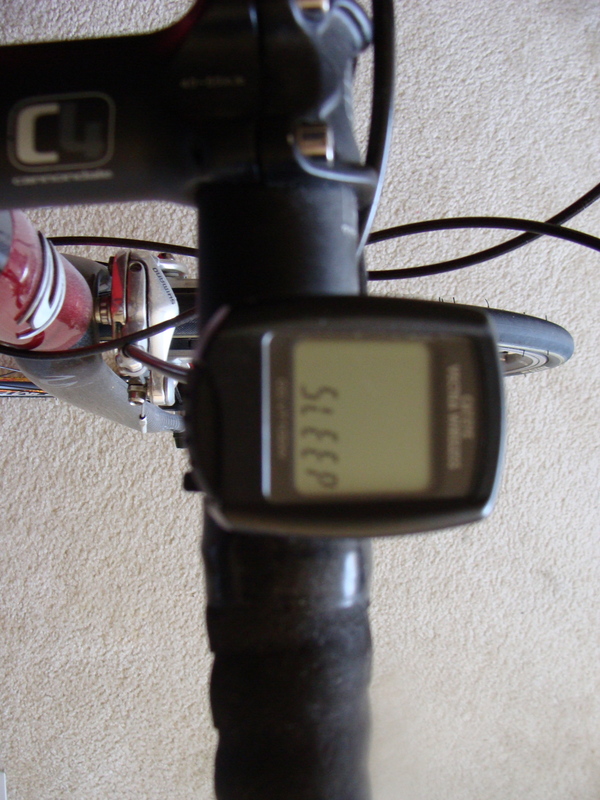 I slept in, had a nice leisurely breakfast of Cheerios while reading the paper, stocked up for the week at the grocery store, watched Duke dominate Carolina in the ACC finals, and was ready to head out into the sunshine for my first outdoor bike ride of the season. This is my bike. 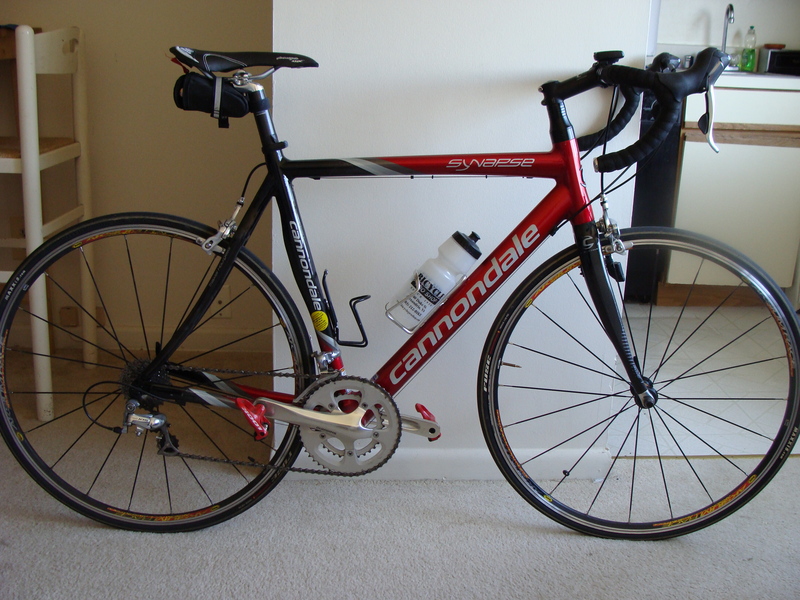 A Cannondale Synapse Carbon 2008 model. I LOVE HER. Yes…she is a girl. I don’t know why, maybe the red, but from the moment I bought her (on super last years model sale) we have been good friends. When I first started riding, I really didn’t like it. But she has really helped me appreciate a good bike ride. As I mentioned a few weeks ago, I have been spinning throughout the winter to stay in biking shape. I love spin classes, but the sun is out, the weather is getting warmer and it’s time to transition outside. My odometer had been doing this for way too long.. 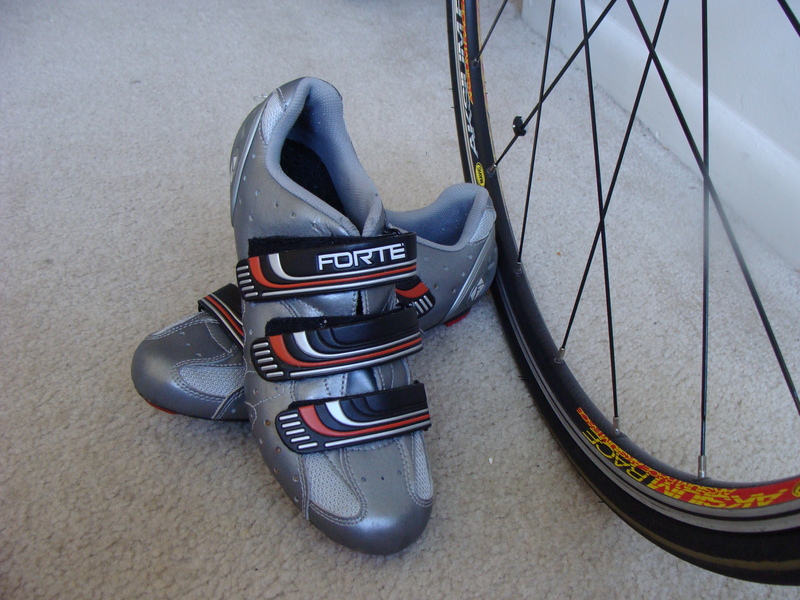 These are my bike shoes, made by Forte, which is a line produced by Performance Bicycle, one of the most well known, middle of the line, reliable manufacturers of bikes and bike gear. Nothing fancy, but they fit great and were a good price. 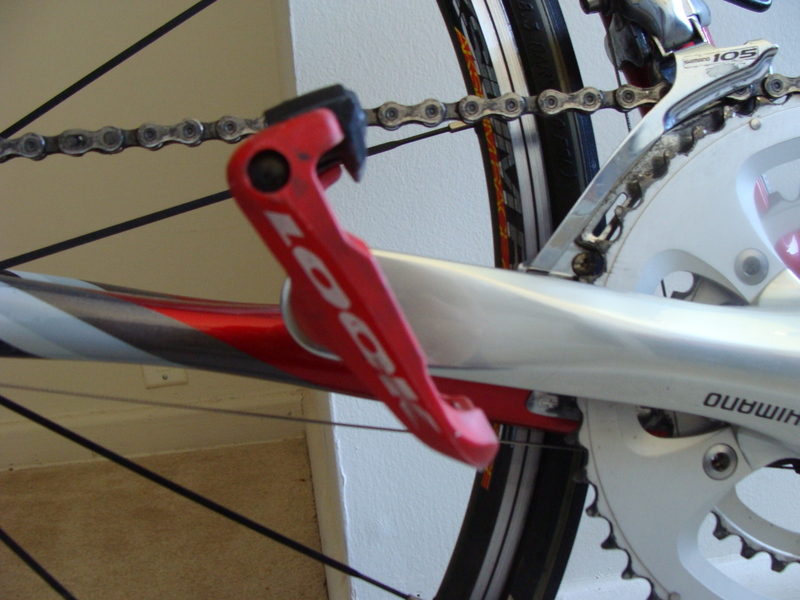 You see…the pedals on my bike are Look pedals, which require special look clips. 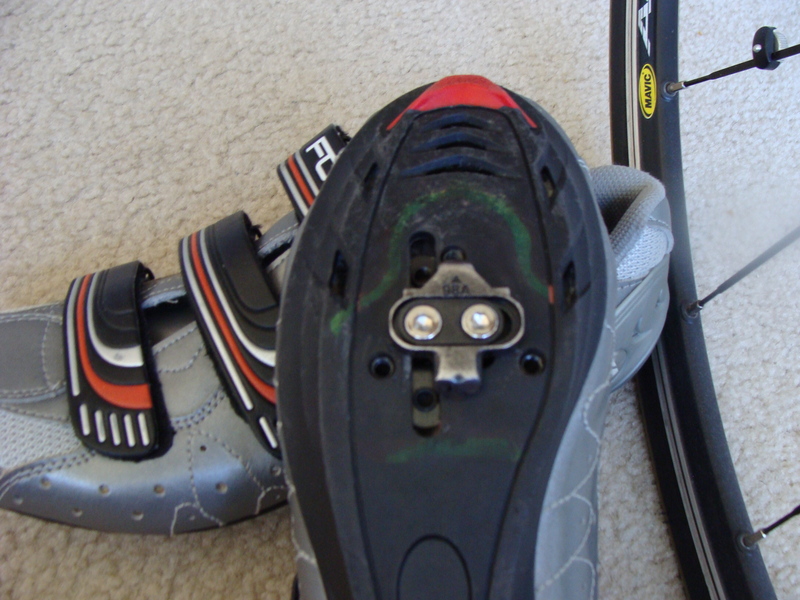 Bikes in spin classes use clips that looks like this…called SPD clips. 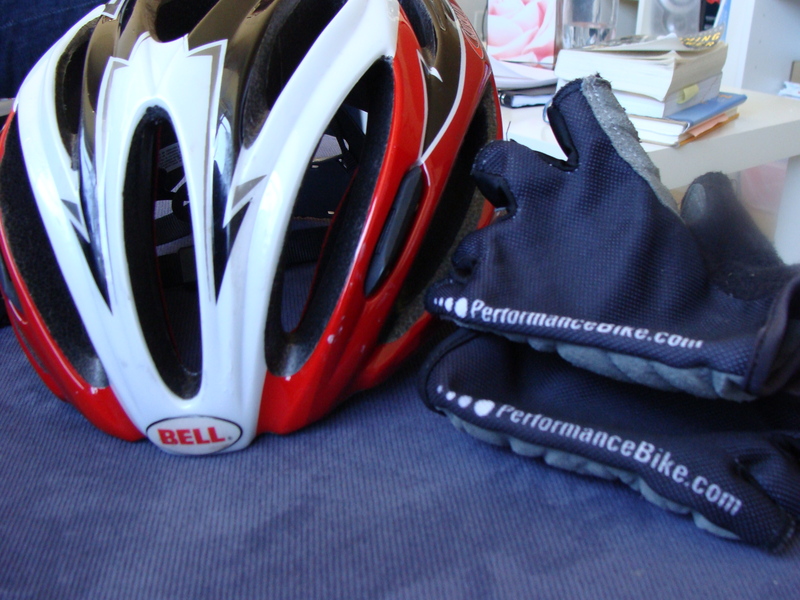 I dug out my matching red, white and black helmet and gloves that I got from Performance when I first started biking and was ready to go! 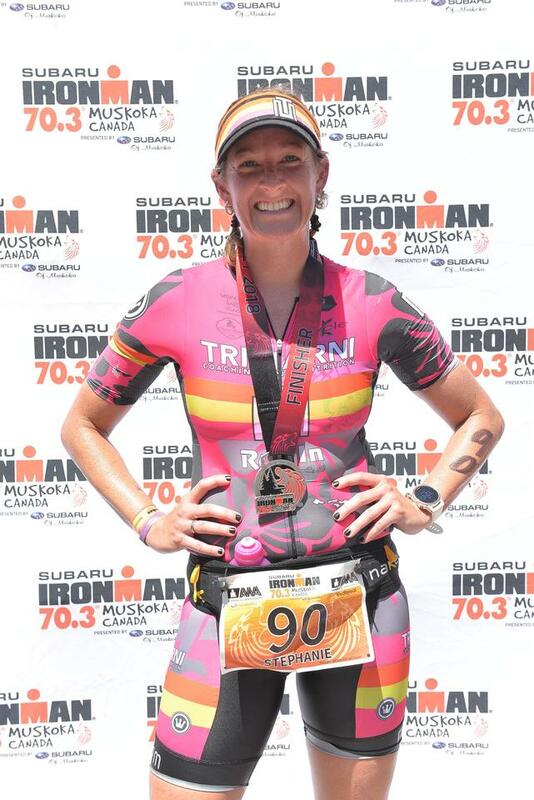 Ok..so maybe the pink doesn’t match so much and the spandex below the spandex might not be super fashion forward, but trust me, not only did these leggings keep me warm, they saved my legs from some major road rash later on…when I wasn’t smiling so big. Chris and I headed out for our standard 30 mile ride just down in a park near where we live. It felt so great to be riding outside again. I was curious how my legs would adjust to being back on my bike and I was excited to find out that the spin classes had kept them in pretty good shape! We were cruising along, sun beating down, wind blowing in my face, about halfway through the ride. Then BAM. Down I went. I was going a little too fast and cut a right hand curve a little to sharply, skidded on some sand and my bike slid out from underneath me. Luckily there were no other riders or cars nearby, but the wind was quickly knocked out of me. I scooted to the side of the road, sat/cried/came out of shock with the help of Chris then dusted myself off. A couple nearby offered to drive but I was so pissed off about falling that I just wanted to get back on my bike and ride home. And so we did…very slowly. In a strange way, I knew it was coming. Every rider has to fall sometime. I lucked out and got away with some road rash on my arm and a little on my leg, a humongo bruise on my leg/rear end (which I will spare you the image of), a nagging headache and cracked helmet. All is well that ends well (with the help of some ice and Advil). Goal of the week: get a new helmet Goal of next weekend: get back out there! 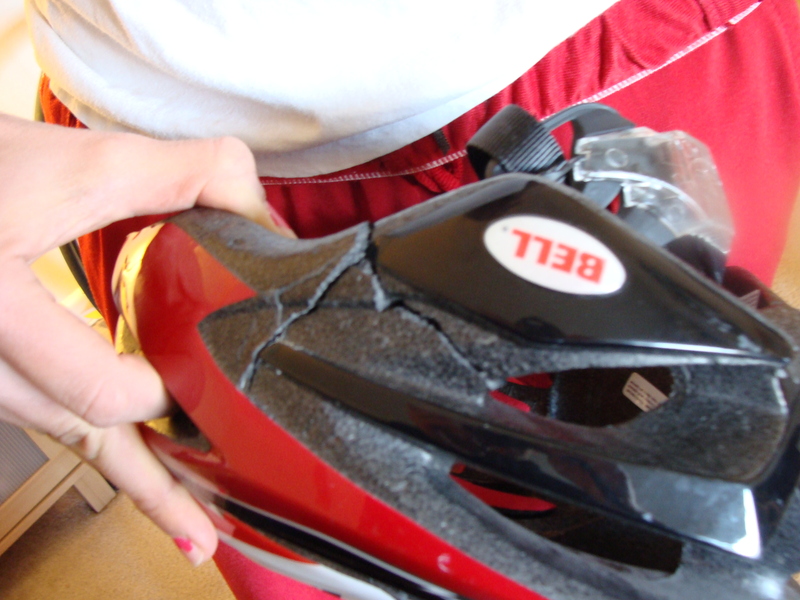 Question of the Day: Have you ever had a bad bike or other sporting accident? Did it put you off of the activity for a while or did you want to get back out there as soon as you could?! I’m so glad you’re OK!! Although, you’ll definitely have a “oh crap, I can’t get my clips out” moment. I had my first one last season. Just think of a cartoon character with their arms flailing all over the place, and you’ve got me. The best part? I did it in front of about 10 people. It was awesome. oooh, glad you’re okay and that you had a companion with you. been there! replaced a few helmets in my day. i’m the same — i just wanted to get back on and prove that it was a fluke! you want to keep moving to keep your body from getting too stiff anyway, right? exactly! Chris was such awesome support! Definitely wouldn’t have known what to do with myself if he wasn’t there! Ohmigosh Chloe!! This post tugged at my heart strings!! First of all, I miss YOU so much and secondly, I’ve had dreams about riding through Rock Creek Park! I can’t believe it’s that time already and I miss our Sunday morning rides from last summer… it’s definitely something I’m looking forward to when I get back!!! You’ll have to go easy on me. I don’t know if I’ll be able to make it up Mormon Hill or Tilden for that matter…. eek!! We miss you too Tyler! !